n/a English. Chaos means disorder. Duke. 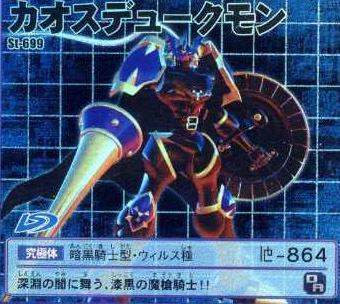 He is not affected by "A goes to 0"
At the beginning of the battle, if you are a Hybrid Digimon who evolves using either the Spirits of Darkness or Light, discard one Dark Area Digimon from your hand and place this card in the Digimon Box. A lance bearing evil knight dancing in the darkness of the abyss!! During the battle if you discard a Spirit of Darkness H from your hand, you will no longer be affected by the C attack's "A goes to 0" and your attack strength triples.